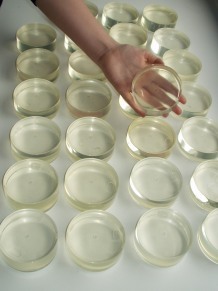 Contact lenses : Biogel materials have been used for 30 years in the manufacture of high water soft contact lenses. Wound care: Biogel materials have seen widespread use in the formulation of wound care dressings for the absorption and control of body fluids. Implants: Products derived from Biogel materials have proved effective as implants in a range of applications, from cosmetic surgery to cavity fillings. Special manufacturing processes enable the production of very large hydrophilic discs and other shapes. These can be machined using conventional methods in the dry condition to any shape. Alternatively cast moulding techniques are used for the manufacture of finished products. Pretreatment of products can create an irreversible one-off shrinkage or expansion in a chosen direction in a pre-formed product or component. This has found applications in reconstructive surgical techniques to aid in the formation of new skin my means of progressive stretching. Wound care products have benefited from the incorporation of Biogel powder materials that are ideally suited to the requirements of proven safety and reliable absorption of body fluids.